Whether you believe there were 9 original muses—the daughters of Zeus and Mnemosyne—or 3 Muses, the fact remains that there exists a few lesser known Muses. You’ve probably encountered one or two of these stealth Muses because they love tormenting….uh, inspiring writers. So forget trying to invoke Calliope, Clio, Euterpe, Erato, Melpomene, Polyhymna, Terpsichore, Thalia, and Urania with the usual Muse summons, “Oh Muses, Sing to me” or “O Muses, O high genius, aid me now!” or coffee and pastries. Not happening—just try imagining their name on a Starbucks cup. Anyway, those Muses are busy taking selfies, writing memoirs—My Big Fat Greek Adventure and Fifty Shades of Zeus—and hobnobbing with Hollywood producers. The real Muses—the everyday Muses for the rest of us—keep a low profile. Here’s a list of the Muses you probably are familiar with. Sarcastic Muse: “I’m certain your banal character will garner lots of sympathy.” “Another calorie-laden mocha will definitely help you meet your deadline.” “Oh sure, resort to that ol’ trope.” “Of course you will figure out that plot flaw by the end of the chapter.” Cough cough. This Muse toughens us up, smacks us around—and we like it! 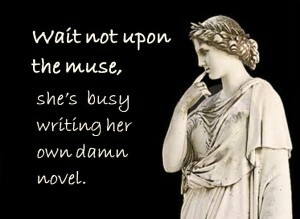 Sarcastic Muse challenges writers by helping us hone our craft. Nodding Off Muse: She comes—this specter of creativity—to fill our minds with characters and story lines and dialog and descriptions compelling writers to leap from their bed and jot down the best ideas ever…but wait, come back, the moment you flick on the light she vanishes into the shadows. Dream Muse: Evil twin of Nodding Off Muse, she fills a writer’s head with wonderful plots, captivating intrigues, and evocative scenes only of which a few can be remembered in the morning. Driving Muse: She comes up with the best, most amazing solutions to your plot flaws and provides riveting dialog while you are driving. The trick is to thank her profusely and repeat her brilliance until you can write it down or find the record feature on your phone. Guilty Muse: “You really should be [ insert chore here] .” I know, you respond, but the words are flowing, the hubby and kiddos can forage for their own food. “Your friends haven’t seen you in a while.” But, I’m almost done, true friends understand. 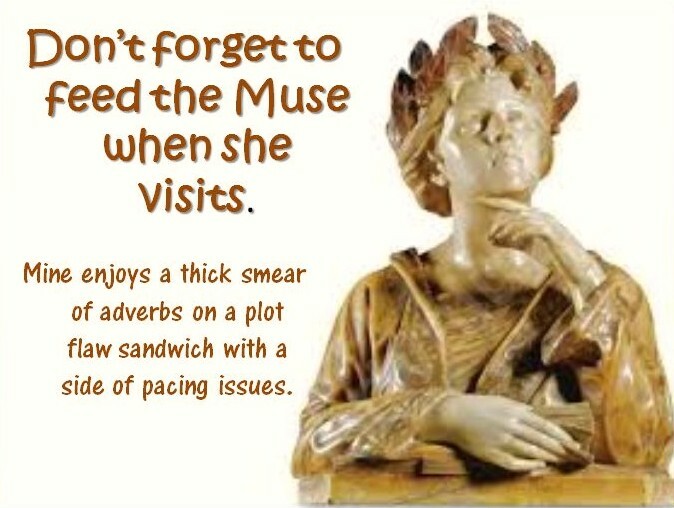 Guilty Muse helps balance our time ( “Fat Chance,” laughs Sarcastic Muse ) and urges us to complete tasks other than writing obsessively during the day–even if it’s as simple as texting hubby Get Toilet Paper on the way home. Ever the practical one, Guilty Muse suggests rewriting a sentence in your head while tossing in the next load of laundry. 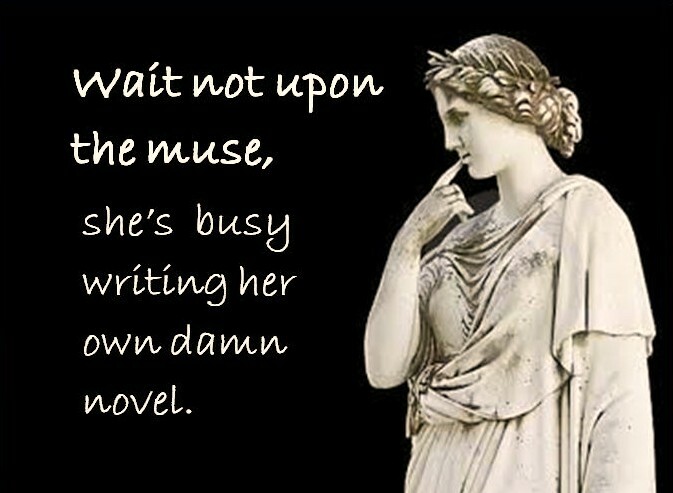 Which Muses visit YOU while writing? This entry was posted in Reading & Writing and tagged LZMarie, muses, the writers life, writing blog, writing muses, writing tips on August 24, 2014 by lzadmin.